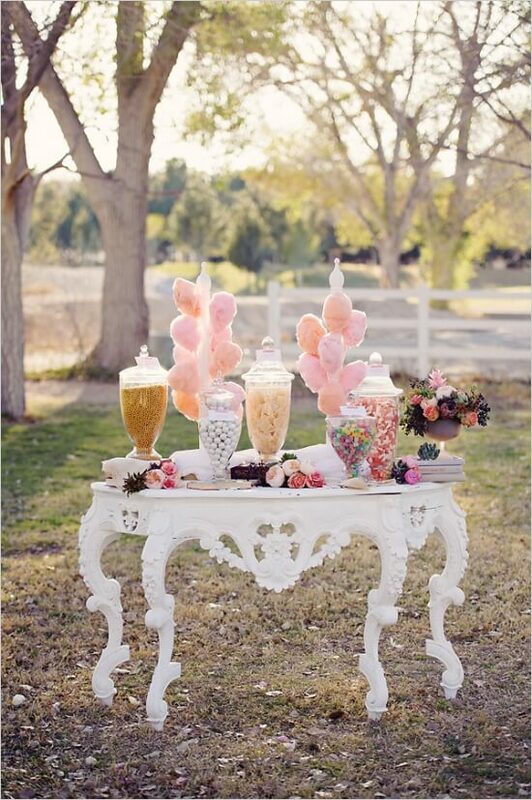 A beautiful Vintage Wedding Candy Buffet adds style and fun to either an outdoor wedding reception or an indoor soiree. A stunning vintage table (a flea market find!) is positioned on the grass; freshly painted in white, this pretty, ornate table is used for the candy buffet table. Search flea markets, thrift shops, garage sales and yard sales for an inexpensive vintage table. Look for something with “good bones”, don’t worry about the condition of the finish (the paint or stain). Scratches and scuffs are no big deal – spray paint is cheap! A can will cost you no more than $10 and that should be all you need to give the table a good coat to make it look like new again. Be creative with color – while white works well, as always for a wedding. But depending on the style of the table and the color scheme of your wedding, you can really have some fun here and take some creative license! Consider even a gold or silver metallic paint, or use an antique gold or silver paint (has more of a matte finish, as opposed to highly shiny like metallic. Be sure to follow the instructions on the can of spray paint for best results. But keep in mind that you will most likely need to sand the surface before applying spray paint to the table, to ensure proper adhesion of the paint. Don’t take short cuts on this step, or you may be very distressed to see the paint peeling on your wedding day. You’ll be amazed at how beautifully a can of spray paint will transform an old table you can pick up for as little as $10 or $15 at a flea market or garage sale – and turn it into a fabulous one-of-a-kind conversation piece for your wedding reception. Now on to what to put on top of the table once you’ve turned it into that showpiece! Use “cotton candy trees” as the backdrop for the tablescape. Simply arrange cotton candy cones in containers, just as you would arrange a bouquet of flowers. To carry the cotton candy theme further, you can consider the cotton candy cones as the wedding favors for guests at your reception. More on that a little further below – keep reading! Select 5 vintage candy jars of varying heights to display on the table. You can buy these online – just run a search. Fill each glass candy jar with a different type of candy – try jelly beans, mints, M&Ms, conversation hearts, cinnamon hearts… whatever you enjoy. Add a few clusters of flowers sitting right on the table for added visual interest, and include one or two floral arrangements in vintage urns to complete the look. Shop flea markets, garage sales and thrift shops for the urns. You’ll be surprised what treasures you can find for cheap! Get yourself a can of spray paint if you want to freshen them up, or use them just as is (its vintage, after all!). A Vintage Wedding Candy Buffet like this helps create a very romantic mood, is so very beautiful to look at, and is certain to impress your guests in a way they will remember. A vintage wedding is a lot of fun to plan, because so much imagination and creativity goes into them. If you’re planning a vintage wedding, you’ll want to spend a lot of time cruising thrift stores and flea markets. These are a great source of ideas and inspiration. Often one flea market find will give life to the entire theme, and you can build all of the other visual elements around it. So if you are struggling to come up with ideas for your vintage wedding, the thrift stores and flea markets are absolutely the place to start. A vintage wedding is not only a lot of fun for the couple (or wedding planner) to plan, but guests tend to really enjoy them too because they totally break out of the same-old, same old “cookie cutter mold” and are usually unlike any other wedding. Guests find them fun and interesting! If you want your wedding to be personalized, individualized, memorable and unique, a vintage wedding could be perfect for you. Remember we talked about the cotton candy trees a little earlier? Looking for something different and memorable for wedding favors? How about individual-sized mini-cotton candy – like the kind you get at the carnival. A super-sweet treat that is reminiscent of happy-go-lucky times. In blush pink, its super-pretty too. 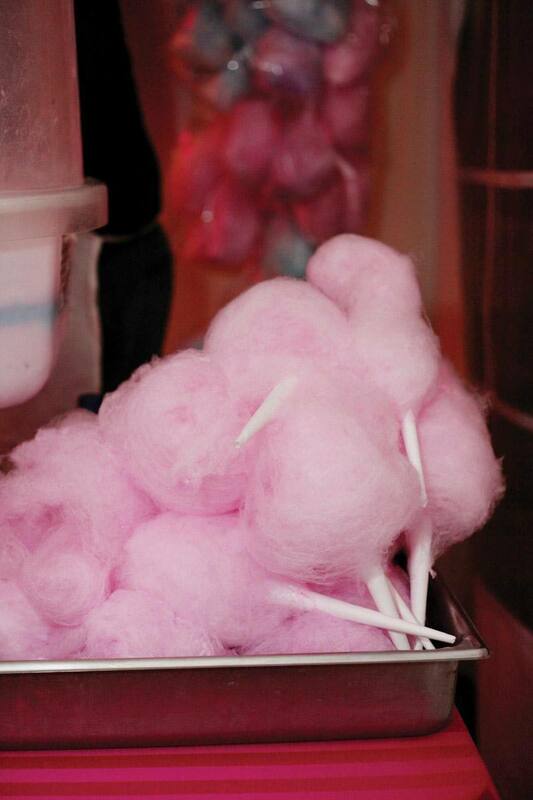 Bet your guests never had cotton candy at a wedding before…. They’ll love it. And when they love it, they remember it. What a fabulous, fun wedding favor! If you love the idea of incorporating cotton candy into your wedding reception, you can take the theme a little further still… with signature cotton candy cocktails. For a fun and fabulous signature cocktail for wedding receptions, simply top champagne with cotton candy! It looks amazing, yet is so easy to do, and WOW, what wow factor! Imagine how your guests wedding react when you plunk one of these in their hands at the reception! Match the color of cotton candy to your wedding colors, if you like, or choose based on your favorite flavor (pink, purple, green, yellow…), or mix things up a bit and offer a variety of colors and flavors. Better yet, stick with blue and let your signature cotton candy cocktail be your “something blue”! This is such a unique and FUN idea! You’re guests will think so too! Photo: Kate Headley, Southern Living Magazine. Get more fabulous vintage wedding ideas to inspire you! Have fun! Design a Vintage Sweetheart Table & Backdrop. Go Shabby-Chic! Dessert Table Wedding Dessert Buffet What’s the Etiquette on Wedding Favors?